In 2013, Inhabitat repeatedly reported on China’s horrific air quality issues – in some cases, entire industrial areas were shut down for days because of life-threatening smog. Much of China’s air pollution comes from coal-fired power plants, but emissions from personal vehicles are also a big part of the problem. The government has invested millions of dollars in an effort to encourage a switch from gas to electric vehicles, but so far progress has been slow – that’s why two Chinese companies, Kandi Technologies Group and Geely Automotive, have taken a cue from Hangzhou’s wildly successful bike sharing program to make electric vehicles financially accessible, while at the same time alleviating pollution, traffic, and parking problems. Some call it the Kandi Machine. The name of the project seems trite until you see the technology in action. An individual arrives at a tall, glass-windowed parking garage and requests to rent a compact electric vehicle. At the push of a button, the building comes alive. Long fork lift-like arms are deployed, snatching up one of many tiny electric cars stacked on shelves like candy. The arm retrieves the vehicle, finally dispensing it from an elevator at street level. The compact vehicles are fully electric, featuring a slide-out battery design patented by Kandi. Each car is capable of traveling 75 miles on a single charge while achieving speeds of up to 50 miles an hour. For many, the cars’ power windows, air conditioning, and enclosed cabin are a huge step up from the small gas-powered scooters that crowd the city streets. For about $20 an hour, individuals can rent an EV to run errands or get to work in a rain shower, all without the high cost and space requirements of vehicle ownership. When they’re done, the electric car can be returned to the garage where it is recharged and readied for the next driver in need. 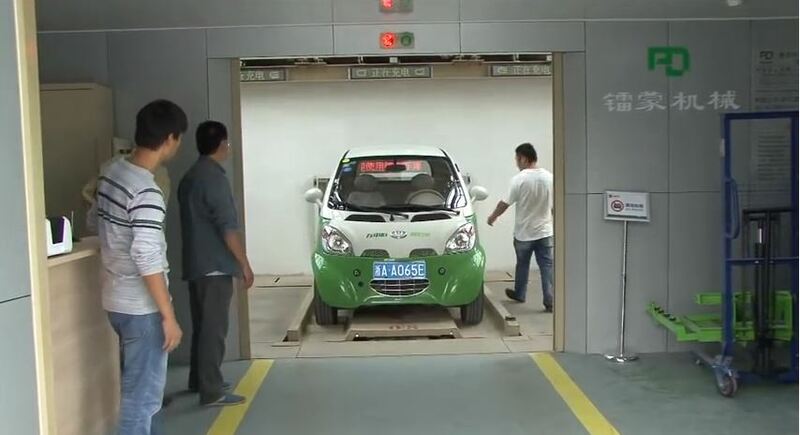 Eventually, Kandi hopes to integrate these car sharing structures into cities across China. The scheme’s ultimate aim is to make using an electric vehicle cheaper and more convenient than owning a gas-powered one. Range anxiety aside, cost and infrastructure continue to top the list of reasons why people are slow to adopt this pollution-reducing technology. Promisingly, Kandi has already rolled out its first two garages and 18 more are currently under construction. In 2013, Inhabitat repeatedly reported on China's horrific air quality issues - in some cases, entire industrial areas were shut down for days because of life-threatening smog. Much of China's air pollution comes from coal-fired power plants, but emissions from personal vehicles are also a big part of the problem. The government has invested millions of dollars in an effort to encourage a switch from gas to electric vehicles, but so far progress has been slow - that's why two Chinese companies, Kandi Technologies Group and Geely Automotive, have taken a cue from Hangzhou's wildly successful bike sharing program to make electric vehicles financially accessible, while at the same time alleviating pollution, traffic, and parking problems. Some call it the Kandi Machine.